Dam is black, 50:50 heading/heeling. 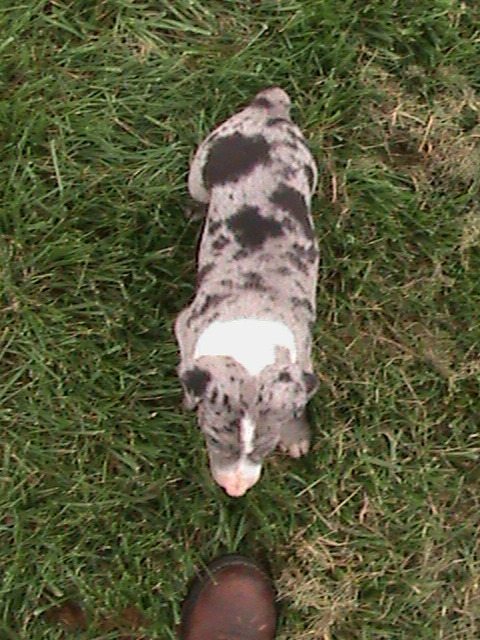 Sire is blue merle, 50:50 heading/heeling. 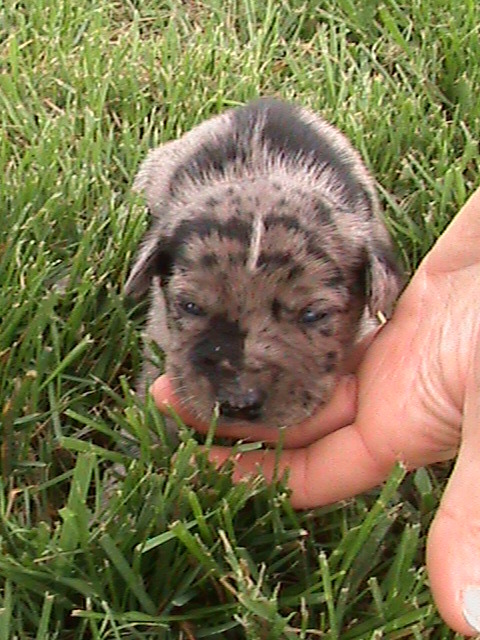 These pups will be ready to travel to their new homes after 05/21/2012. 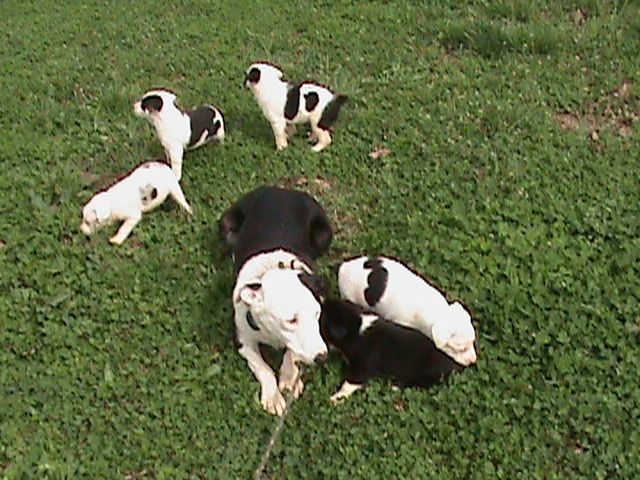 UPDATE: May 13, 2012 – sales of this litter are complete. Dam is black, 50:50 heading/heeling. 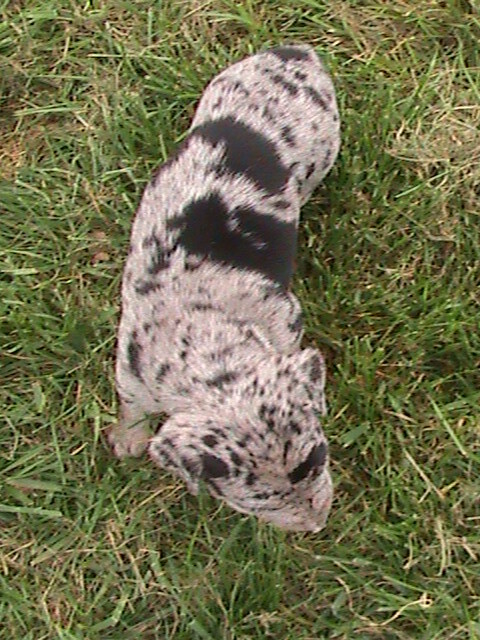 Sire is blue merle, 50:50 heading/heeling. 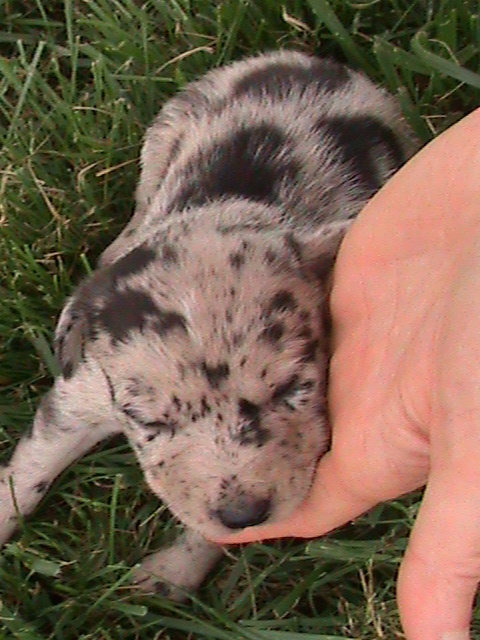 These pups will be ready to travel to their new homes after 05/10/2012. 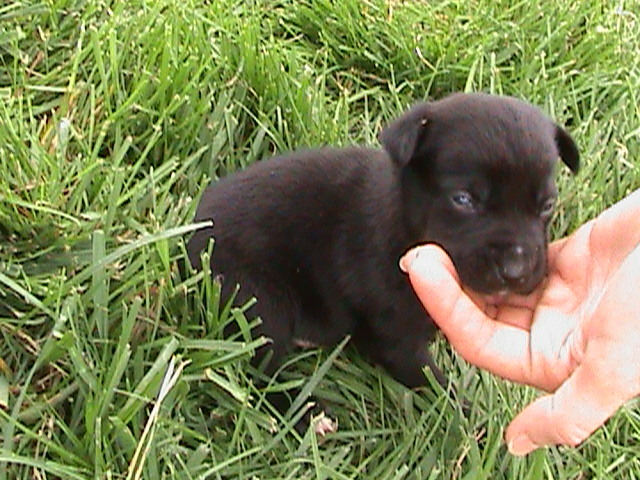 Updates: May 13, 2012 – Sales of this litter are complete. 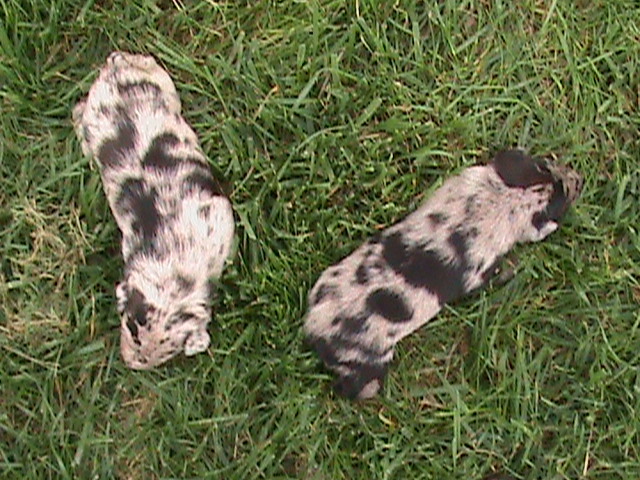 Litter #1. 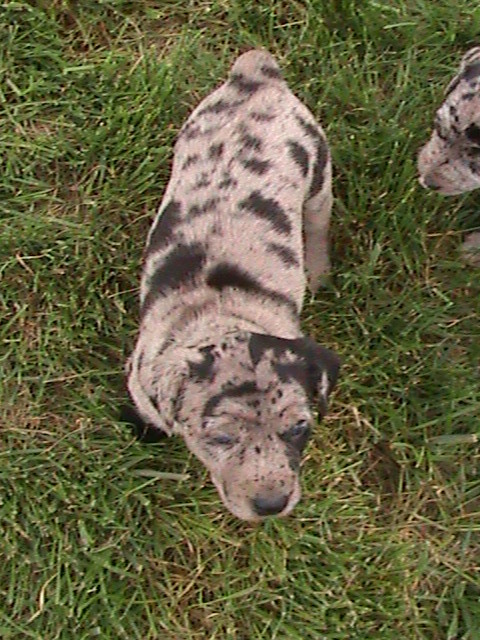 Pups born 02/20/2012. 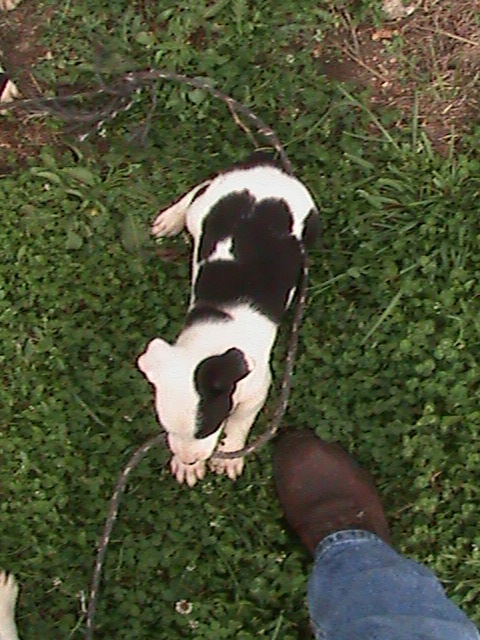 Dam is a 50:50 heading/heeling, black & white. 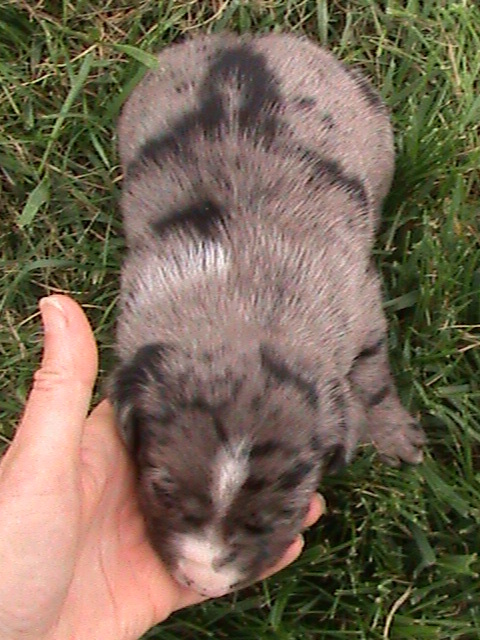 Sire 50:50 heading/heeling, smokey blue merle. 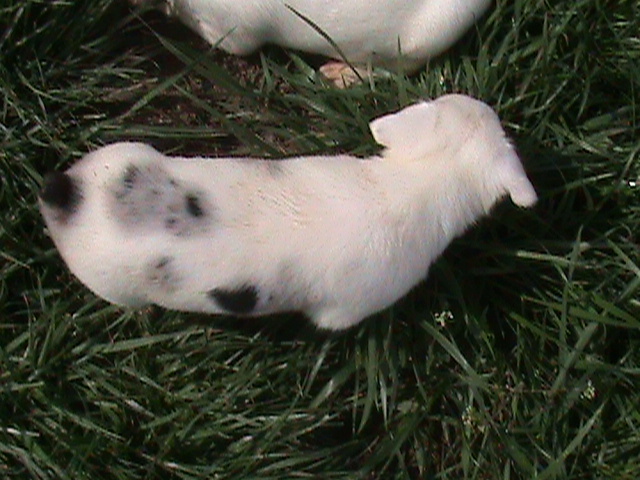 Eye color in these pups is going to be brown &/or blue. 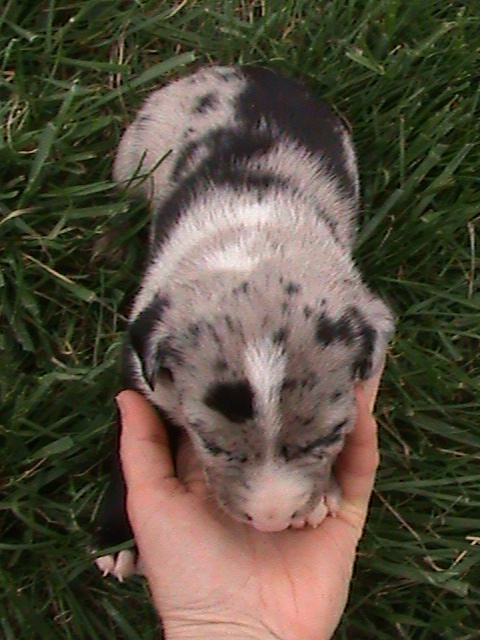 These pups will be ready to travel to their new homes after 04/29/2012. 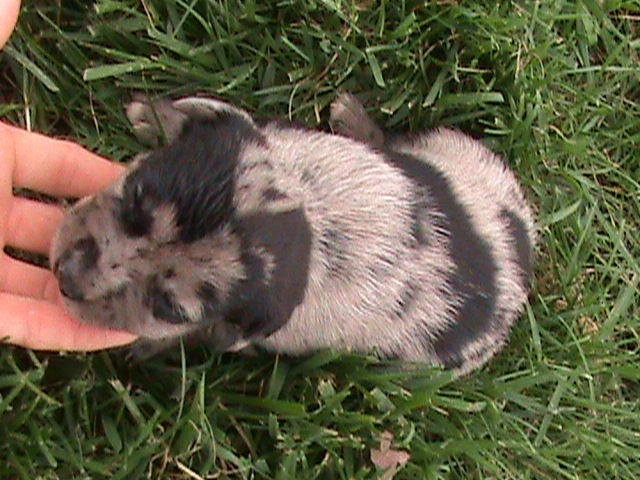 Litter #1. 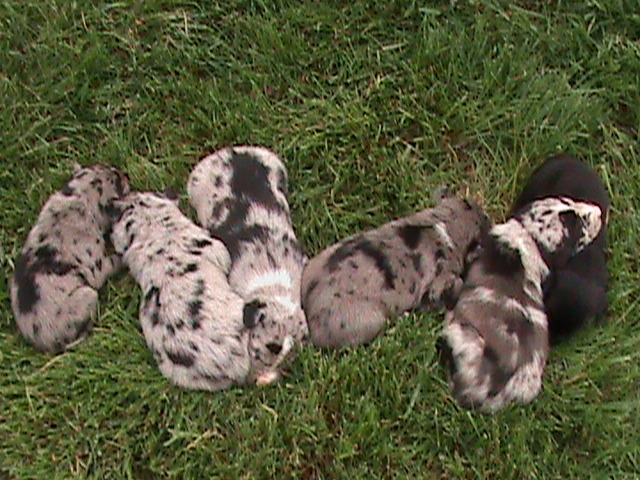 (Left to right, top to bottom) #5 Female, #2 Male, #1 Male, #4 Female, #3 Female. Talked to a great friend today that I hadn’t visited with in a long time. He’s a great hand and was talking about their calving, lack of summer grass that has been leased up by ranchers from the S in the drought areas. He was grumbling about how hard it is to find good help these days…and how things are not like they used to be. I reminded him of when his dad was working fo…r my dad in the Sandhills, living in the bunkhouse, going to town one weekend out of the month, eating my mom’s cooking in the cookhouse. I reminded him that he doesn’t work like folks used to either. He grouched at me,”What’s that suppose to mean?” I said, “Well, for one thing you wouldn’t be getting to take the time to ride to a hilltop to get a cell signal or taking time to snap a picture…you’d be fired for screwing around…instead of putting in a full day’s work.” All we had back then were Motorola 2-way radios in pickups and we thought we had the world by the tail! We didn’t care that we didn’t have TV. We just laughed then. Nothing is really like it used to be! Here is the scene from my parent’s kitchen window this morning. My dad used to sit at the table and look out the window. Mom would say, “Is the grass growing?” He’d smile and quietly say, “I hope so.” Dad’s been gone 16 years this Labor Day. Like him, I now look out the same window and feel the same way. Yes, I hope the grass grows today! Now that I have all this harrowing and fertilizer spreading done…I think I’ll get some yard sticks to watch the grass grow…3 weeks of tractor riding around, I can honestly say I’ve listened to enough Rush Limbaugh, Hannity, whoever on Talk Radio, some not so entertaining CW music…FYI, we don’t get Juni, RW, Adrian, Don Edwards, etc. 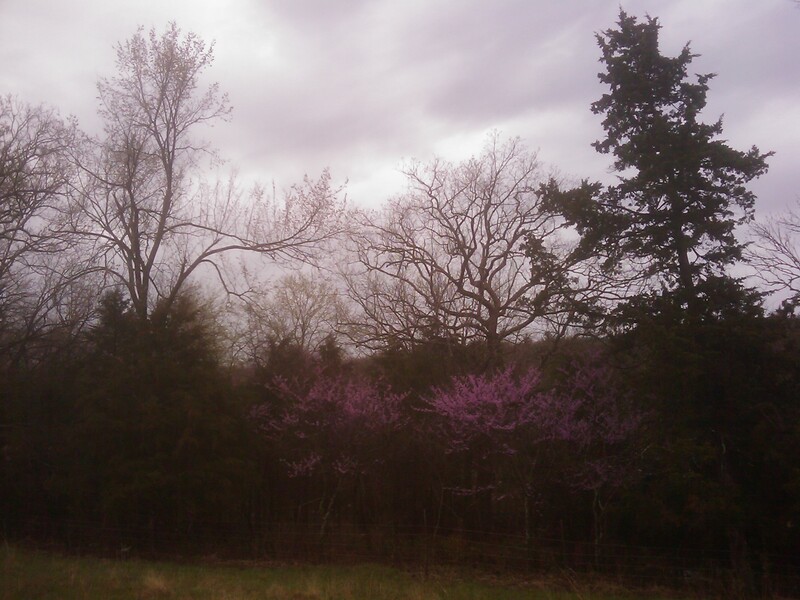 here in central MO! 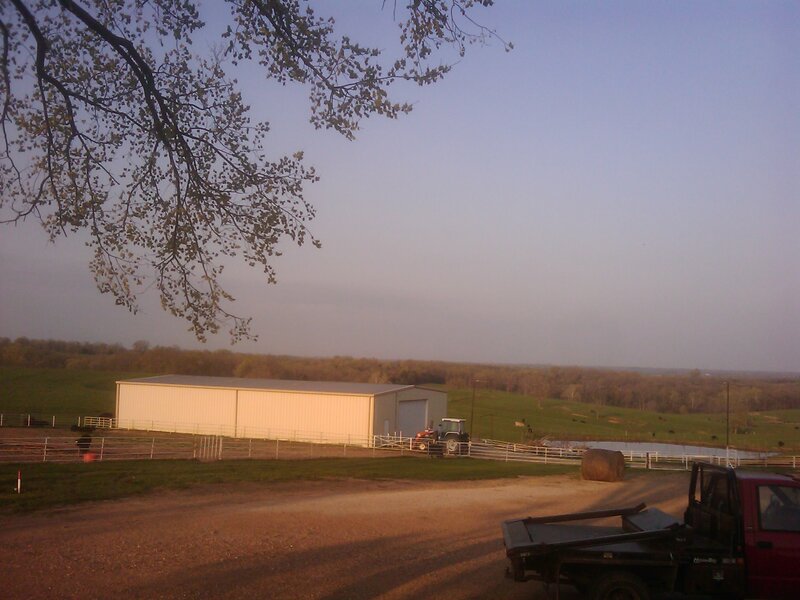 I’m ready to get back to spring cattle work…when the forecasted rain spritzles get gone we’ll be gathering/pourin’ cows. Sure hope all the work pays off! Else, you’ll be seein’ me at the door at Wal-Mart handin’ out carts…! In January, I took a litter of pups out for a field trip. We headed east from the barn and went about an 1/8th of a mile and the two adult cowdogs I had with me picked up “a scent in the air” to the S. I quickly switched our field trip direction to the N. Whatever the scent in the air was, I was not interested in finding out. I couldn’t smell anything, but judging by Hawk and Jewel’s reaction, it was something dead…and that meant I was not interested in them taking off to check stuff out. Yesterday, the wind was out of the right direction and the smell of rotten death came across loud and clear. I had not seen buzzards scouting anything so I did not take the time to go check things out. 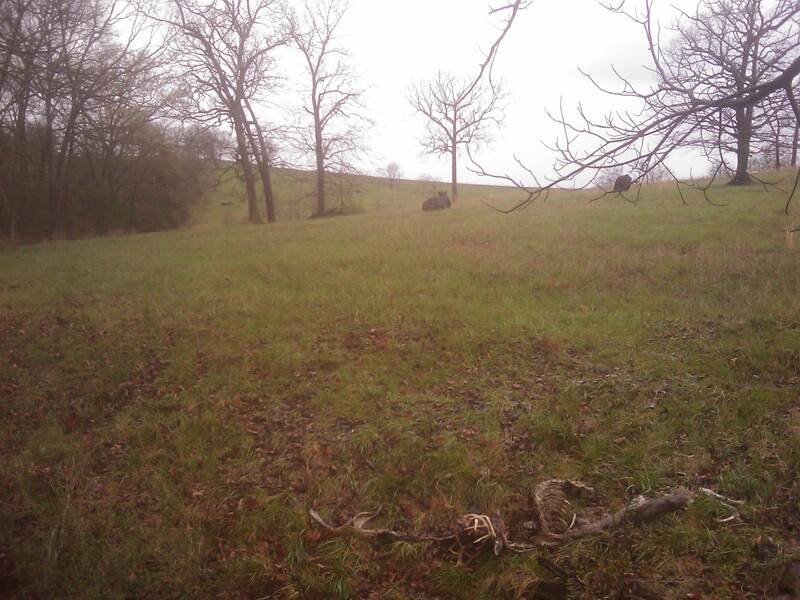 But, I knew something was dead and not too far away because I have had an occasional cowdog slip off and come home with rotten hide in their teeth and the smell of dead, rotten deer on their breath. Being pressed for time and trying to get things done before the forecasted rain…I again, did not go to check things out. Today. 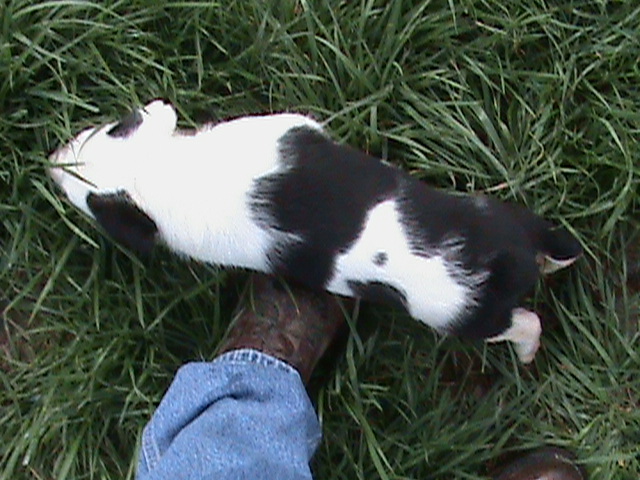 Well, I had the cowdogs out while I was cleaning pens. 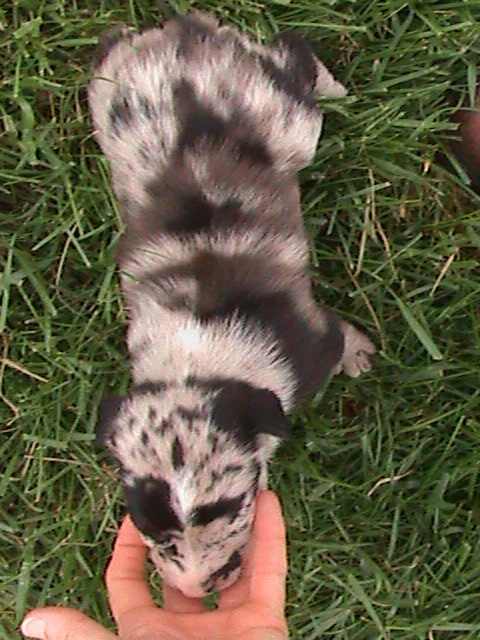 When I got to the point of time to feed, I was 6 cowdogs short. I called out, “Dogs, come.” After a bit, I picked up sight of 3 cowdogs coming from the cedars to the SE. 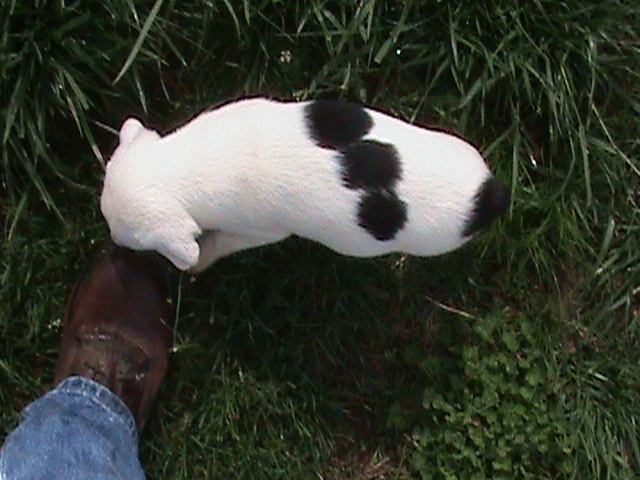 One other cowdog came from the E. Two cowdogs were no shows. The cowdogs that came home smelled like nasty, rotten deer. Soon another cowdog showed up. Which left me one short…Levi. Levi is never away…never. So, I knew something was wrong. I set out to find Levi. 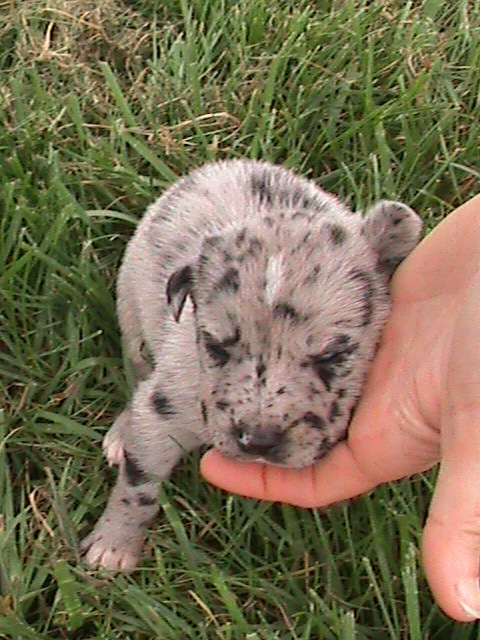 I went S in the direction that the first set of cowdogs came from. 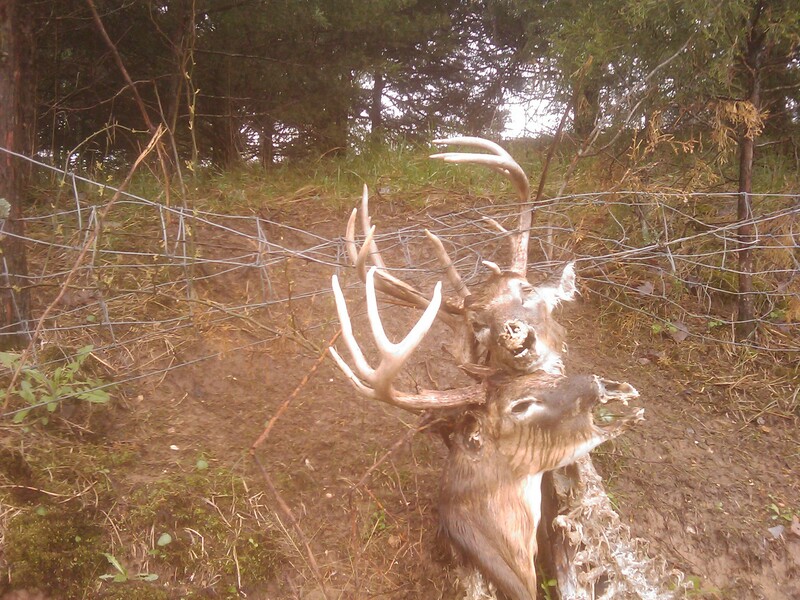 About 1/4 mile away at the line fence I found a heck of a sight. 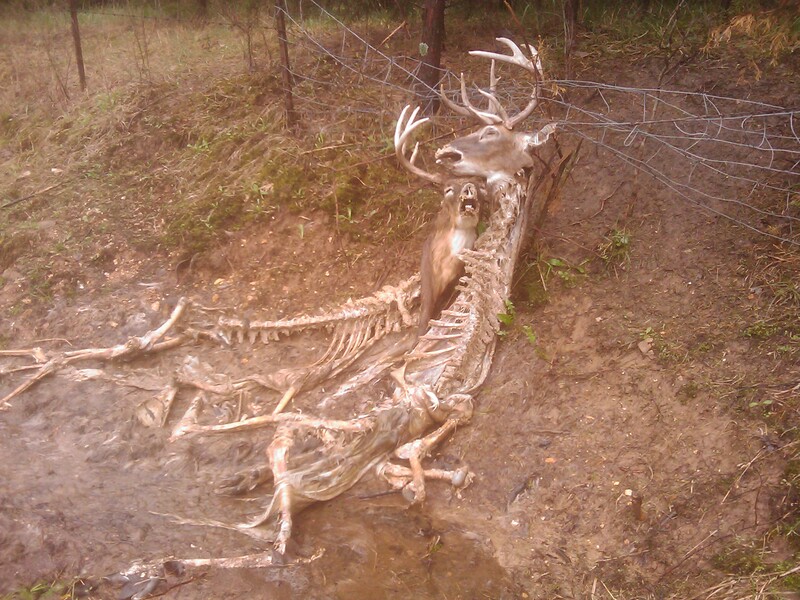 Two dead deer tangled in the fence. They had been dead for months. Their bodies had simply dissolved away into mush. Levi was not here. I headed E, up the line fence. 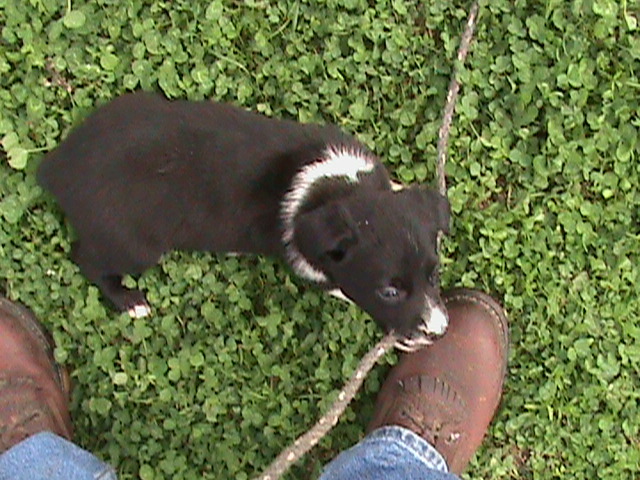 I went a little ways and called, “Levi.” Immediately out of the woods into the pasture came Levi. I was glad to see him, but I was not happy from the mere fact that he had left home. 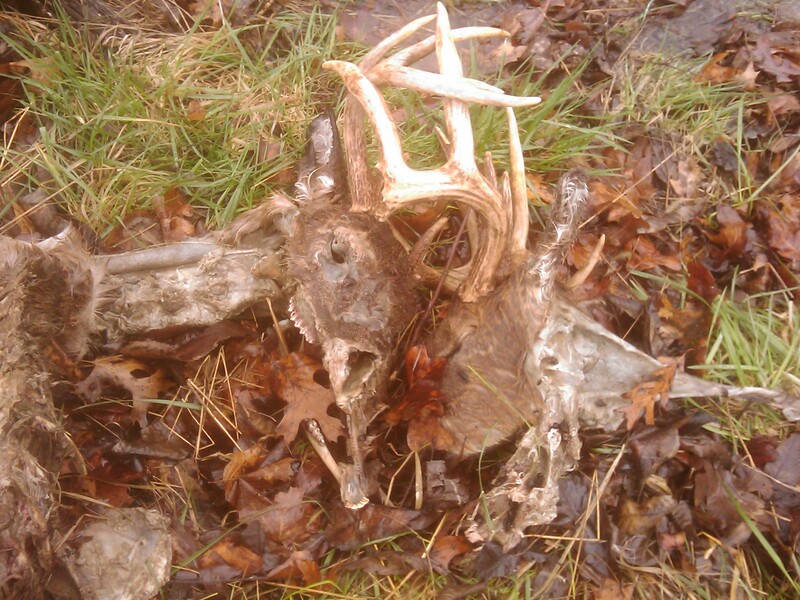 He came to me and smelled like dead deer and was slurping his lips like, “Um hum, snack.” I thought, “Yuck.” It always concerns me with finding deer dead here because of the chronic wasting carcasses that folks have found. I sent Levi home and he went. I went on to see if I could find what he had been dining on. No one would believe this story, right! I walked home and got the 4-wheeler, fence pliers, cart and camera. Afterall, I had to take pictures of this. It’s like the fish that got away and everyone says, “Right. Sure. You bet!” But, here they are! I carefully cut the one set out of the fence. 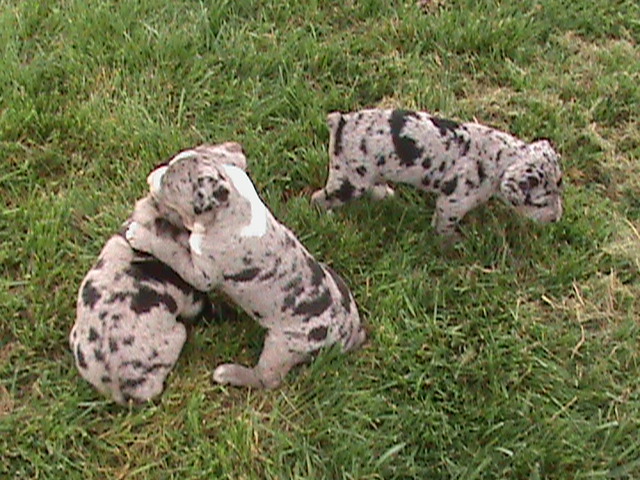 Not disturbing their head lock. Carefully drug them to the cart. Carefully got them loaded up. I drove on to pair #2. I took more pictures to show the closeness of where pair #1 and pair #2 died. I even took pictures of the pile of white hair. 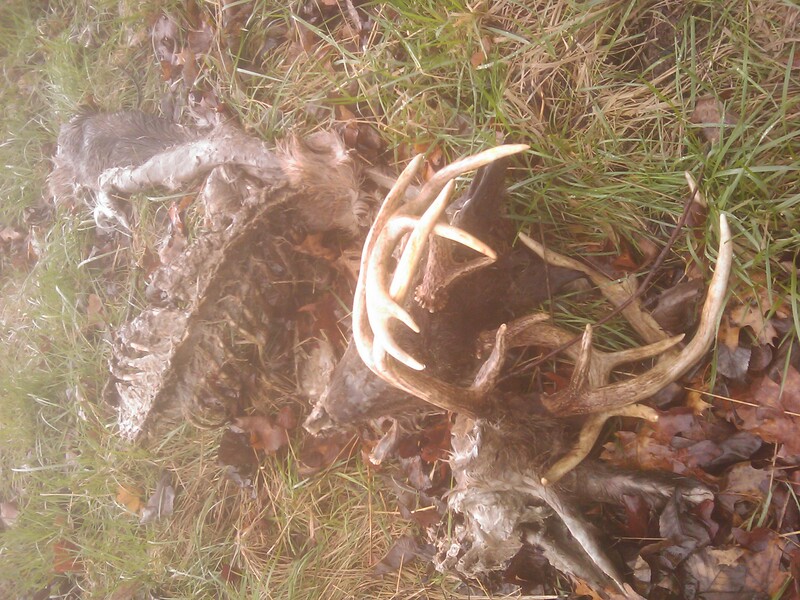 I just seemed like that pile of hair belonged to another buck. 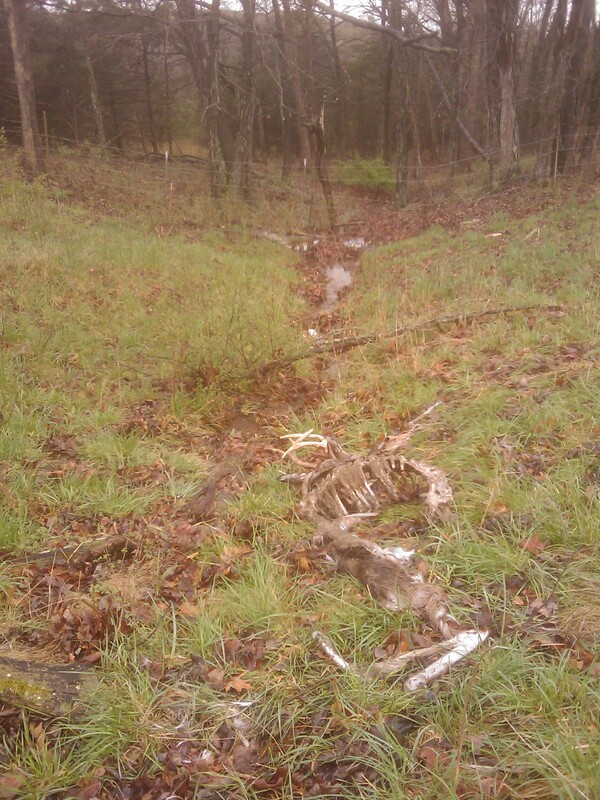 And sure enough, later towards evening, in the rain I walked back to the sight of pair #2’s death and looked around. 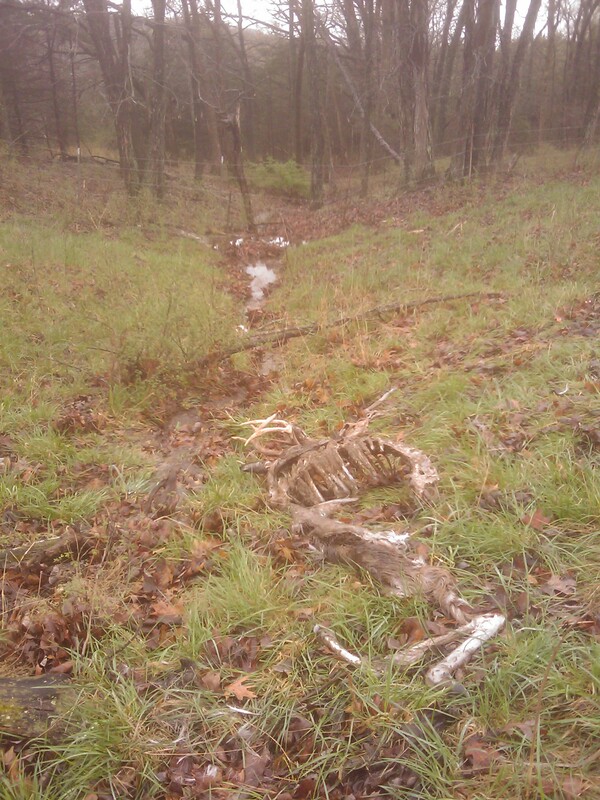 In the woods I found another buck…dead. 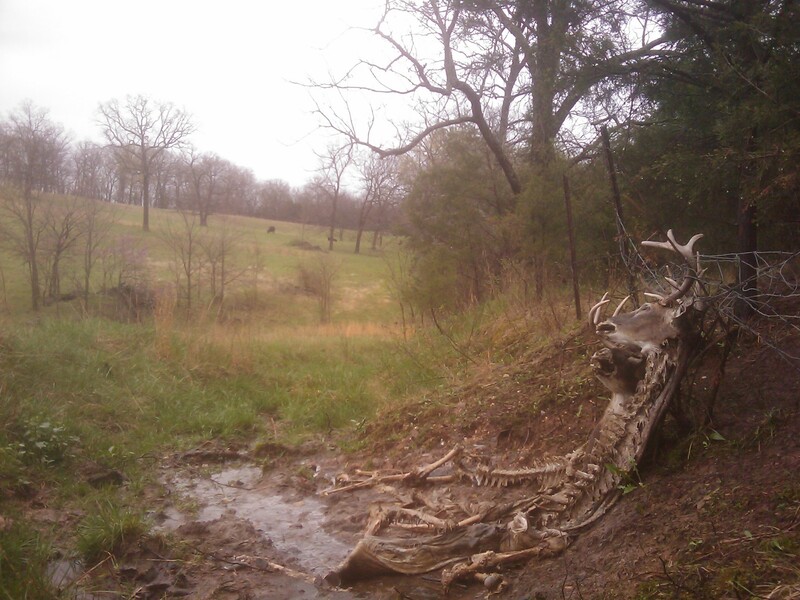 What is really odd about the dead pairs is that the coyotes had not dined and drug the carcasses around and chewed them apart. 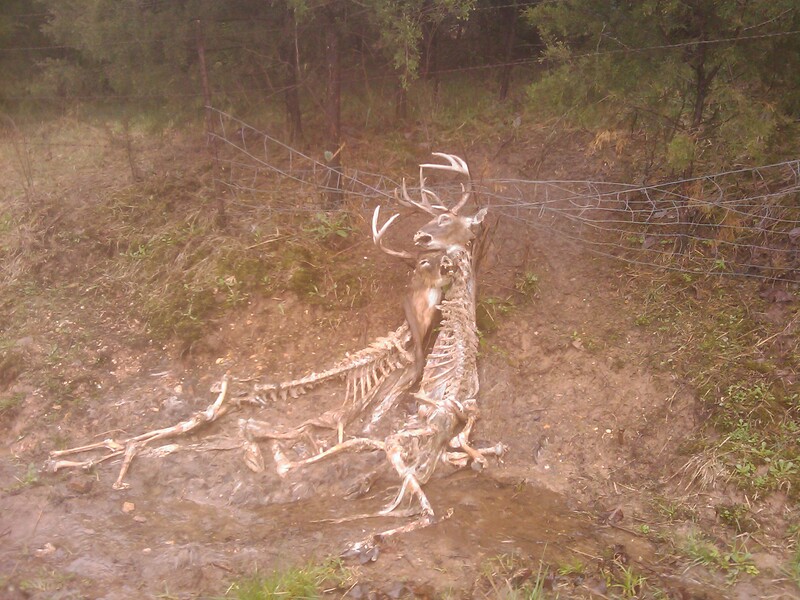 It is like the coyotes left the bucks as an honor to the ravages of the mating wars. Like an honor code among the wild. I took my 4 bucks on home and parked them in out of the rain. 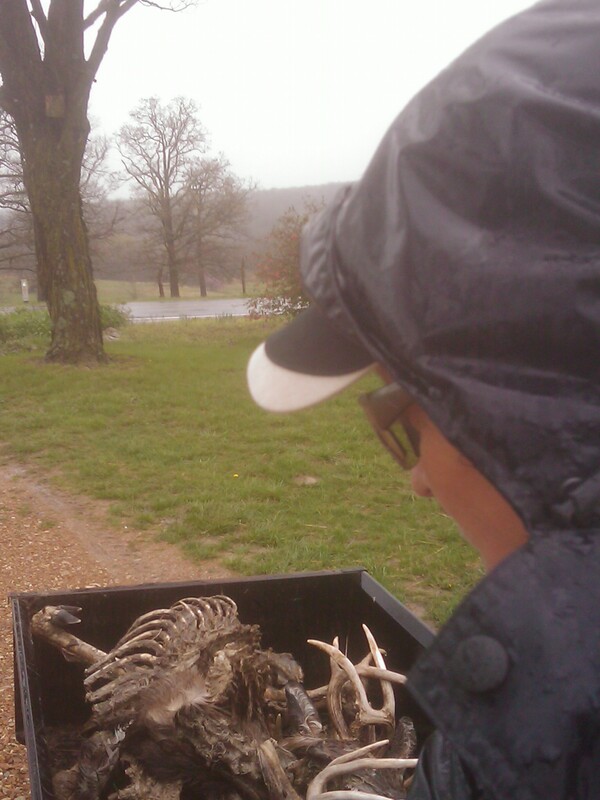 Some kind of beetles were crawling out of their skulls and mating in the cart…what a deal…smelly, rotten deer and happy mating beetles. The perils and pleasures of nature! I wonder just what kind of “hot doe” got these boys all worked up! Quite a day, quite a day. You just never know what each day will bring. And, on a happier note. We got our first really measurable rain in nearly 10 months. 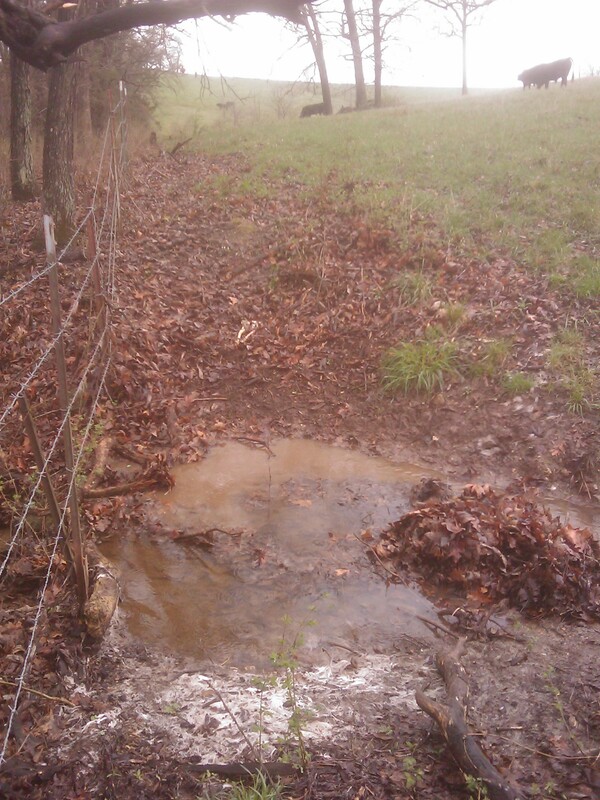 We got around 4 inches of rain during the night and it came pretty decent. The rain was desperately needed and welcomed. Too bad these bad boys are going to miss out on the new grass.